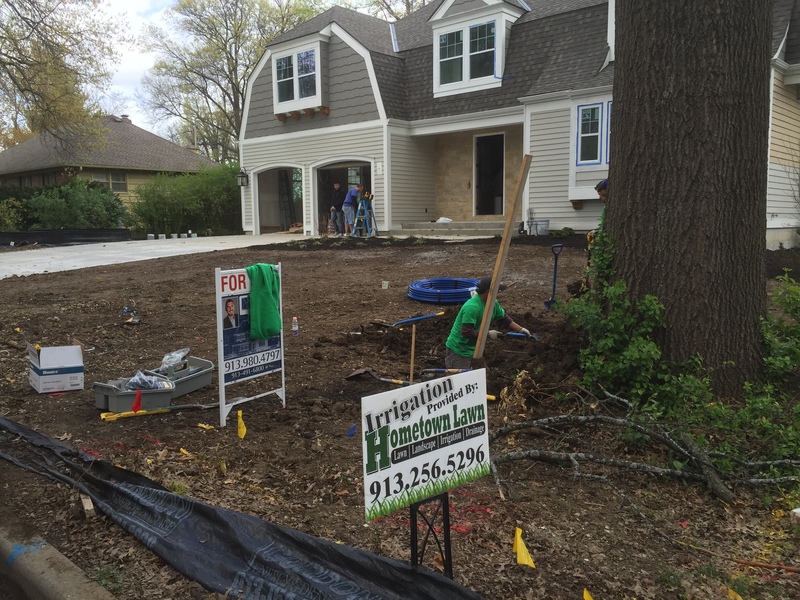 The first stop for a quality, professional lawn care, landscape design & installation, new or old sprinkler irrigation installation & service repair company in Prairie Village, is Hometown Lawn. Here at Hometown Lawn, we are the Prairie Village lawn care company your friends refer. We are the Prairie Village sprinkler company your neighbor is using. We are the Prairie Village drainage solutions provider your boss used to stop the mud and muck from coming in the house with the kids and dogs. Need a stamped & colored concrete patio? That’s us. Why, because we care. We are from here, this is our Hometown. Graduates of Olathe South, then the South Dakota School of Mines & Technology for engineering, our leadership is second to none in the Prairie Village lawn and landscape world. Get it done right the first time. We hold more licenses than just about any company. We are licensed pesticide applicators for your Prairie Village lawn. We are licensed plumbers for your Prairie Village irrigation. We are licensed engineering for your Prairie Village drainage & concrete. We are licensed inspection for your Prairie Village SWPPP and BMP project. Match that. You can’t. Our team of Prairie Village lawn care professionals perform mowing, fertilizer applications, aerating, verticut and overseeding and complete turf restorations for your Prairie Village home or business. A healthy lawn has fewer weeds, more grass and uses less pesticides, making it better for our environment. Our Professional Turf Care Program will get your Prairie Village lawn in top condition. 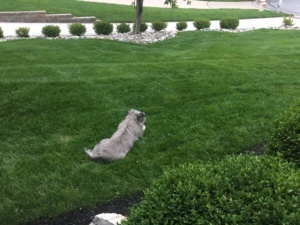 Hometown Lawn offers Prairie Village landscape design & installation services. Our designs can include computer generated models of your proposed improvements. We self-perform all landscape services. Whether you are looking for a complete removal and re-design, the creation of an Prairie Village outdoor living space or a simple concrete patio, we can do it. Hardscape or softscape doesn’t matter, we’ve done it. Belgard & Techo-Bloc contemporary are just a few hardscape options. Got a complicated Prairie Village retaining wall? It’s not for us, we have an engineering division. With Hometown Lawn, you know it will last a long time, because it’s done right the first time. Whether you’re seeking a new Prairie Village sprinkler irrigation installation, need improvements or simple sprinkler repairs on your old system, maybe a review of the performance of your existing sprinkler system? Hometown Lawn is the professional company you want. Our experience is vast, our methods are proper and our company is licensed for plumbing. We install more complete systems per season, than some have done yet. Our professionals are here to advise you on new developments in the industry, water efficient options, wifi controllers, drip and micro-irrigation and overall performance expectation. A proper design and installation means lower operation and maintenance costs. Who doesn’t like a lower Prairie Village water bill? If you just need a sprinkler repair at your Prairie Village home or business, we have a dedicated technician just for you. Trained by an engineer and complete installation experience, our technicians know sprinklers. Whether you just need a sprinkler head replaced or controller, we have them on our truck. We set appointments, get in, get it fixed, and get gone. Prairie Village drainage solutions are a specialty of ours. Through the eyes of an engineer comes the answer. Having a licensed engineer visit and discuss your issue with you goes unmatched in the regional drainage game. We come to your house, by appointment only, and review with you the problems you are having, discuss scenarios and research the probable causes. We will discuss the proposed solution and reasonable expectations associated with the proposed action. Prairie Village Real Estate Agents this is for you! We can help with that listing that’s had water in the basement. We offer something no one else can, and that’s our Letter of Action (LOA). Our design/build drainage solutions are available to option our LOA. The Letter of Action is a statement that describes our implemented solution for the proposed problem and is then signed by our licensed engineer. Talk about a disclose statement safety net! Who else can offer that for our price??? You would have to hire an engineer AND contractor. Not with us, it’s all here. 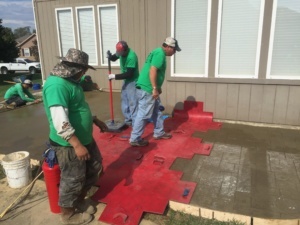 If your looking for a quality Prairie Village concrete contractor to install a colored & stamped or plain concrete patio, Hometown Lawn is your answer. Concrete is a specialty of Civil Engineering, and that’s who we are. Mix design, proper application, drainage routing & management are all important to a long-lasting patio or landscape feature. Every project is designed for proper sub-grade preparation, internal reinforcement and mix, then sealed appropriately. If you’re wondering how much colored and stamped concrete costs in Prairie Village, just contact us for a FREE ESTIMATE. We’ll set an appointment to visit and discuss your project.